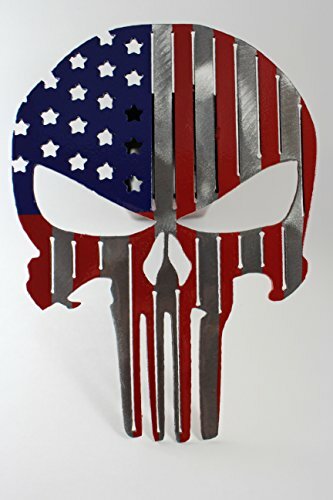 Punisher flag hitch cover fully welded, painted and clear coated. This Punisher comes painted with blue stars, and red and silver stripes.This hitch is a great way to show your love for the USA! These hitch covers are 6 inches wide by 8 inches tall, and come with the hole drilled to secure to your vehicle. Please ask us about any customization's! All pieces come fully powder coated now! Due to the harsh environments that these hitch covers exist in, rust proofing can not be guaranteed. If you have any questions about this product by Turpins Horseshoe Creations, contact us by completing and submitting the form below. If you are looking for a specif part number, please include it with your message.